The City of Golden offers an extensive and interconnected trail system of 24 miles, providing diversity in both types of trail experience and destinations. Regional trail connections provide a link to neighboring communities and open space. Download the trail map from the City’s website. Chim ney Gulch Trail is in the Jefferson County trail system and is connected to the Windy Saddle Trail and Park. The trail climbs 2,000 feet in 2.5 miles from Highway 6 to the summit at the Lookout Mountain Nature Center. The trail is moderate to advanced and passes through grass prairie and pine forest, crossing streams at several places. Access the trail via Lookout Mountain Road west of U.S. Highway 6 and roadside parking on U.S. Highway 6 eastbound from State Highway 58. Cressman Gulch Trail begins at Ford Street and Mesa Drive, across the street from Norman D. Park. It is a steady climb to the intersection of Ford Street and Highway 93. It is easy to continue south to the downtown area crossing the bridge and continuing on the Tucker Gulch Trail, which connects with the Clear Creek Trail. The trail is .6 mile in length. Access the trail via Ford Street and Mesa Drive, across the street from Norman D. Park. Grant Terry Trail is compact dirt, 15 feet wide, and is adjacent to Clear Creek for .7 mile up the canyon. This is an excellent pedestrian trail in the hot summer months; there is typically a cool breeze. Access the trail via the Clear Creek Trail west of the Clear Creek RV Park. Kinney run trail is a .75 mile taxing trail which begins at the Heritage Square parking lot off Highway 40 and runs north to the Tripp Ranch Property. A short climb to the highest point offers a superb view of the Denver/South Platte Valley. Then, it’s all downhill through Heritage Dells Park to Tripp Street. Access the trail via the Heritage Square parking lot off U.S. Highway 40. Lubahn Trail, a 2.5 mile trail loop, is in the gulley below and south of Castle Rock on South Table Mountain. The trail climbs about 400 feet to the base of the cliffs. The trail has been extended to create a loop hike of moderate difficultyand is an excellent one-hour excursion. The Castle Rock is private property, do not trespass. Access the trail via Belvedere Drive and 19th Street. Magpie Gulch is a group of trails that connect one of Golden’s newest developments along Highway 93 to neighborhood schools, the Golden Community Center and the downtown area. Access the trail via Iowa Street west of State Highway 93, Washington Street near Quail Court or Rubey Drive at Mitchell Elementary School. Nightbird Gulch Trail is in the Jefferson County trail system, providing access to Mount Galbraith Park. The trail is moderate to advanced in diffculty and accesses the Front Range Foothills. The trail is rough, with many rock steps and ledges – and is hiker-only as it accesses Mount Galbraith Park, a hiker-only park. Wildlife mammals include elk, moose, bighorn sheep, black bear, deer coyote, fox and mountain lion. Access the trail via Valley View Court and Canyon Point Circle. Tony Grampsas Trail is a 1.3 mile trail which follows the west side of Tony Grampsas Park, often following the Church Ditch, and terminates at the north end of the park. Access the trail east of Tony Grampsas Gym on Salvia Street, on Easley Road or at West 50th Avenue and Quaker Lane. Paleontology fans should try the Triceratops Trail, which runs along the west side of Fossil Trace golf course and includes some interesting fossils embedded in the limestone. Tucker Gulch Trail is an uphill 1.10 mile trail beginning at Vanover Park at the end of Clear Creek Trail and travels up the Tucker Gulch drainage to Norman D. Park on Ford Street. It provides a steady climb along an abandoned railroad bed. Access the trail via Vanover or Norman D. Park. 6th Avenue Trail is approximately 2.5 miles in length and provides a critical north-south access to the community along Highway 6. Future plans for the 6th Avenue Trail include a connection to the Clear Creek Trail at 19th Street. 19th Street west of 6th Avenue turns into Lookout Mountain Road. This is a designated bike route for approximately 2 miles. It is an extremely high use travel way for several types of recreationists including bikers, walkers, hikers, long-boarders and those traveling to the hang gliding and paragliding launch on Lookout Mountain. The Johnson Road Trail starts at the intersection of South Golden Road and Ford Street and travels south along South Golden Road where it intersects with the 6th Avenue Trail. The trail is approximately 2 miles long. Johnson Road to Splash TrailThe Johnson Road to Splash Trail also connects Johnson Road to 6th Avenue traveling along Fossil Trace Golf Club. Highway 93 Trail is continuous on the east side of Highway 93 from Iowa Street north to Tucker Gulch, where it intersects with a trail leading out of New Loveland Mine Park. An on-street connection to the Magpie Gulch Trail is also possible on this trail. 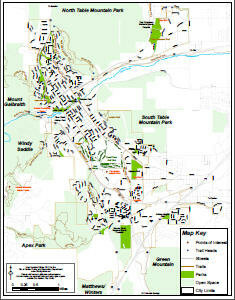 This material in this section is reprinted with permission from the City of Golden from Golden Parks, Trails, and Open Space Map.